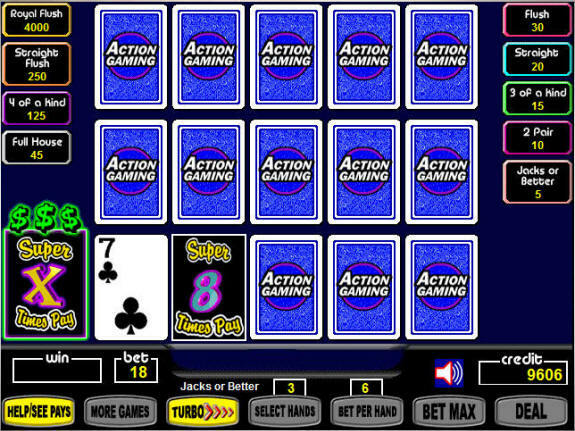 Super Times Pay is a relatively new video poker variation that increases the payout on any game. How it works is that you pay a sixth coin in exchange for a random multiplier that sometimes pops up to increase your win. The multiplier either provides you with a 2x, 3x, 4x, 5x, 8x, or 10x bonus on any win. As I just mentioned, if you bet the sixth coin you'll have the chance to hit a multiplier card. Multiplier cards show up once every fifteen hands, and the average multiplier size is 4.05x. This makes the average win after a multiplier about 20.33% more, which is a good bet as you're only paying 20% more to wager the sixth coin. Because of that, you should always play Super Times Pay games versus normal games with the same pay table. In this example I received an 8x multiplier. After the mystery card reveals your multiplier, it then moves to the left and reveals your actual card in that position. As we mentioned before, the sixth coin/multiplier bet is a good value. In fact, it increases the expected return of any normal video poker game. To calculate the expected return for any Super Times Pay game, multiply the normal return by 100.00278. So for example, for a Super Times Pay 9/6 Jacks or Better game you'd multiply the normal 99.54% return by 100.00278 to come up with the Super Times Pay return of 99.82%. We only have enough room to list a few percentages here, but remember, to calculate the Super Times Pay return of any machine, just multiply the machine's normal return by 100.00278. This will give you the exact return. One thing to keep in mind is that although Super Times Pay machines are always better than corresponding normal machines, often times the casino will lower the pay tables on the Super Times Pay machines to make up for the difference. Always make sure to verify the pay table on a Super Times Pay machine before deciding its better than a normal one. One thing to keep in mind with Super Times Pay machines is that although the expected returns are always higher, the variance is also much higher. What this means is that you're going to see some pretty big swings as you play. Make sure you have a bankroll that can withstand major swings as you ride out the peaks and valleys. The reason Super Times Pay has more variance is because you're putting the sixth coin in every hand, but the multiplier only comes around once in a while. Because you're betting six coins per hand instead of five, you are going to lose more money in between the big payouts. The longer you play, the closer you'll get to the expected return. Super Times Pay games (unlike Multi Strike games) do not require any special strategy. You just play with your normal expert strategy, and the multiplier takes care of itself. Unfortunately, we do not know of any online casinos offering Super Times Pay games for real money. If you'd like to play Super Times Pay video poker, you'll have to head to a live casino. Your best bet will be the larger casinos in Las Vegas.